Newborn sepsis, an important cause of neonatal mortality in Papua New Guinea (PNG), is the target of an exciting new collaboration between Burnet Institute and Glaxo Smith Kline. The joint project aims to improve the uptake of postnatal care services, including facilitating the availability and distribution of chlorhexidine, a topical antiseptic applied to a newborn’s umbilical cord stump in the first week of life. Listed by the World Health Organization as an essential medicine for maternal, neonatal and child health, chlorhexidine has been shown to be effective in helping to prevent neonatal sepsis in low-income countries such as PNG, where a high proportion of births occur at home with the use of unsterilised instruments. The PNG National Department of Health estimates that neonatal sepsis is responsible for 25 percent of the country’s 5000 newborn deaths each year. “We know that chlorhexidine is highly cost-effective in the right setting – but there are two key challenges: establishing sustainable procurement and distribution systems, and providing services immediately after childbirth (also known as ‘postnatal care’) in a way that families can and will use,” Dr Chris Morgan, Burnet Head of International Development, said. “So in this instance, newborns are at risk because a potentially life-saving medicine is not being stocked by facilities, not used by health workers or demanded by families, and the larger problem is our recent research finding that access to routine postnatal care is low in the province. 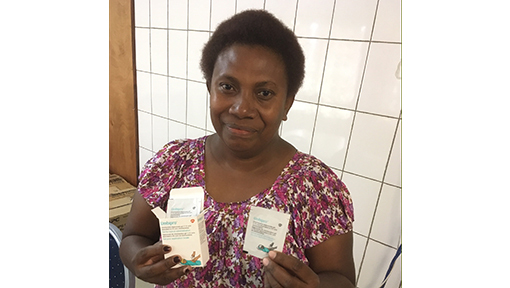 Burnet and GSK’s plan is to work with government authorities and professional societies at national and province levels – specifically in East New Britain (ENB) province – to test different processes for improving postnatal care, while also improving supply of chlorhexidine. Once procurement and distribution processes for chlorhexidine are set up in collaboration with the ENB Provincial Government, Burnet will undertake an implementation research project on the feasibility and acceptability of enhancing postnatal care services in the province, including the provision of chlorhexidine for umbilical cord care. The study will fit under the umbrella of the Healthy Mothers, Healthy Babies (HMHB) program based in ENB, which aims to identify the major causes of poor maternal and child health, and interventions to improve reproductive, maternal, neonatal and child health outcomes. 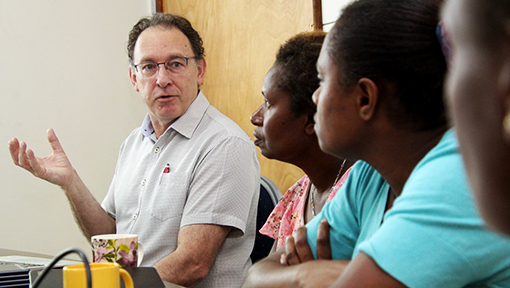 This ensures that other key research partners, including the PNG Institute of Medical Research, government agencies and local health facilities, are joining Burnet and GSK in this initiative. A key aspect of the study is the promotion of postnatal care and use of a chlorhexidine gel (Umbipro) by frontline health workers and community-based health volunteers in ENB. Developed by GSK with Save the Children, Umbipro comes in single-use sachets that do not require refrigeration, which makes it suitable for resource-constrained settings such as PNG. “Our simple chlorhexidine gel was developed through a partnership with Save the Children, and is a great illustration of how collaboration can stimulate imaginative responses to tough challenges,” said Pauline Williams, SVP Head of Global Health R&D, GSK. Burnet Director and CEO Professor Brendan Crabb notes this model of partnership between the corporate, NGO and local government is an innovative step in achieving health development outcomes for vulnerable communities. ‘’Working collaboratively with stakeholders from different sectors is key to ensuring we leverage existing skills and capacity with the aim of achieving a greater impact in a shorter time,’’ he said. Click here for more background on the Burnet GSK Chlorhexidine Project.